WASHINGTON (Reuters) - Two years after filling the streets of U.S. cities to protest the start of Donald Trump's presidency, women will march again this weekend to try to build political pressure against him ahead of the 2020 elections. The loose movement around the marches has splintered as it enters its third year, and one of the various groups now involved has faced criticism it is anti-Semitic, which it denies. 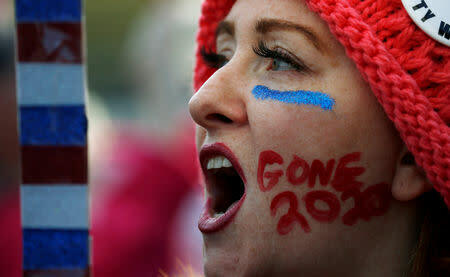 But leaders of the groups say momentum has not slowed, and the rallies will celebrate unprecedented gains for women in congressional and state races in last year's midterm elections. Millions of people took part in the women's marches in Washington and other cities in the United States and abroad on Jan. 21, 2017, the day after the Republican president was sworn in. Vanessa Wruble, a co-founder of the original Women's March on Washington who left to start March On, a separate grassroots coalition, said the movement has evolved from being a reaction to Trump's presidency. It was "essentially the resistance movement, and now you see the movement being far more proactive," she said. Women's March, a national nonprofit organization that evolved from the initial Washington march, is using its #WomensWave marches in Washington and elsewhere on Saturday to roll out a 10-part policy platform that includes raising the federal minimum wage and protecting reproductive rights. "Women are just not on the agenda in this current administration," Women's March Chief Operating Officer Rachel Carmona said. March On will kick off an initiative to mobilize women voters by hosting a "March on the Polls 2020" on Saturday in dozens of cities, including Boston and Denver. Dozens of like-minded organizations will host training sessions for activists and prospective candidates. More than 400 women have applied to attend a candidate training session this weekend in Washington hosted by Emily's List, an organization that works to elect women who support abortion rights, said spokeswoman Tonya Williams. Wruble said the 2018 elections showed the movement had "shifted the balance of power" in American politics. More women were elected to the U.S. Congress than ever before and many of the new Democratic women lawmakers cited Trump's presidency among the reasons they decided to run for office. Of course, women are not all united around the same causes. The annual "March for Life" by anti-abortion campaigners, which takes place in Washington on Friday, is a movement of people who broadly embrace Trump and Republicans. At the outset, March On was bankrolled by leaders covering expenses out of pocket, but it raised a "sizeable" amount of money in 2018 and aims to raise $2 million in 2019, Wruble said. March On distributes funds to local affiliates for on-the-ground planning, provides design assistance for websites and logos and gives access to a public relations firm. In February and March, the group's leaders will meet with affiliates to determine how best to support their efforts over the next election cycle. "This year is really going to be about increasing our tool chest of what we offer to them," said March On's Natalie Sanchez, an organizer of the 2017 Boston Women's March who is also with March Forward Massachusetts, which is leading Saturday's march there. The Women's March now counts national progressive groups like the American Civil Liberties Union (ACLU), Planned Parenthood Action Fund and Move On among its partners. March On partners include the ACLU, Rock the Vote and Emerge America, which recruits Democratic women to run for office. Women's March's Carmona said she spends 60 hours a week on planning calls, including "chapter" calls with 30 to 45 local organizations. The group did a 10-state tour ahead of last year's congressional elections and is developing a nationwide strategy that would train more local leaders ahead of the 2020 presidential contest, she said. There have been growing pains in a movement that grew out of hundreds of loosely affiliated marches in 2017. In cities such as New York, there will be multiple events on Saturday hosted by different organizations, largely due to calls by some religious leaders to boycott Women's March over criticism that some of its leaders are anti-Semitic. Women's March leader Linda Sarsour issued a statement condemning all forms of anti-Semitism and bigotry. Leaders Tamika Mallory and Bob Bland reiterated on ABC's talk show program "The View" this week that they were committed to a movement that fought all forms of oppression. Leaders of Women's March and March On insist the divisions are not a weakness. "I know there have been controversies this year and rifts and divides and those may or may not affect numbers on particular marches, but I haven't seen that have any effect on the movement's strength over all," Wruble said. Carmona said "there is a role for everyone" no matter which group they join, adding decentralized movements had a kind of power that is "hard to strike at."